The smell of hazelnut coffee still makes me queasy. It is a reminder of an ice queen who once ruled where I worked years ago. Clueless, out-of-touch, manipulative, narcissistic, sadistic and just plain bad bosses can be found anywhere. Take the one where a man collapsed at work. His boss stepped over him as he lay on the floor, and she strolled to her office. One wag said that the boss’s only concern appeared to be whether the employee had turned in a report she was expecting. Some bosses are human stress factories. One bragged that he loved to keep employees off-balance. When he learned that one of his minions was applying elsewhere, he sabotaged that employee by passing on a bad job evaluation to the prospective employer. These examples almost make Dilbert’s pointy-haired ignorant boss, and the harmlessly deluded and insensitive boss in “The Office” (Michael Scott, as played by Steve Carell), appear sympathetic and wise. If these examples sound remotely like the situation you’re in at your workplace, take heart. Their tasks are to go start the boss’s car while fellow goons inside take bets on how long it’ll take for a bomb to explode. Frank “The Fixer” Acavano (played by professional wrestler Captain Lou Albano) drives Harry and Moe to the racetrack. He tells Moe to place a bet on a specific horse. Harry knows that the boss has been losing money on the horses. He persuades Moe to gamble on another instead, and they can take the winnings for themselves. The boss’s pick comes in first, and they wind up losing $250,000 of the boss’s money. Needless to say, Castelo is – to put it mildly – disappointed. Still, he rejects a remedy offered by “The Fixer,” the mob’s chief enforcer. “Let me waste ‘em, Mr. Castelo!” Acavano urges. “Do we really hurt them by killing them?” Castelo asks. “It’s a good start,” sagely concludes Frank Vincent (as Louie Fontucci). “The Fixer,” Acavano, will whack whoever survives. When the two guys are tipped off about the plan, they steal Acavano’s prize Cadillac and go on the lam to a casino in Atlantic City. There, they run up charges on Acavano’s stolen credit card. Harry hopes to visit his Uncle Mike and persuade him to bail them out so they can repay Castelo. Things do not go according to plan, and the mob is hot on their trail. Moe Dickstein writes a farewell letter to Castelo that stuns them all. This screwball mobster comedy is a primer, a how-to on turning the tables to get a little justice. Just have a plan in place before you head out the door. Then, you can mail out that “take this job and shove it’ letter with a smile on your face. Have you had a bad boss experience you’d like to share? Keep the comments PG please. Until my last job, I had pretty good bosses . . . and when I had my own company I strived to be a good boss. As for commenting on it . . . still too fresh; it would just piss me off traveling down that road. A negative experience can stick with you a long time until you shake it off and are embraced in a more welcoming and supportive place. Best wishes to you, disperser. I’ve been down that road and was glad to leave it in the dust. I’ve had mostly good bosses. I remember one bad boss, when I was in my twenties, who tried to say negative things to me after I told him I was resigning. I think the word he used was “quitter,” like I wasn’t up for the task. I told him I could do it, I just didn’t want to. I wonder where he is today. We often do ourselves a favor when we look elsewhere for opportunities that are more engaging. Your boss’ myopic vision of your abilities were wrong. It’s likely he’s still stuck in the same groove … at the same old place or a different one. I had one boss and one coworker. I called both of them over the years, one at a school (a principal) and one at my current warehouse job, the coworker. I labelled both “Queen Bees.” This wa much better than using the B word out loud! I am sorry that yours ruined you for hazelnut coffee, Judy! With a few changes, Judy, your list of awful bosses could describe three of the worst-ever school administrators and department chair I worked with during my thirty years of teaching. One was SO awful that he definitely would have stepped over a collapsed employee…and snapped his fingers for someone to get busy and clean up the obstacle. Seriously. Marilyn … I do think that karma comes back to bite these bad applies. There were no ‘sorry to see you go’ parties for either of these bosses. But, for those who knew the male boss before this workplace, they just couldn’t jibe the image they had of the guy they knew with the negative stories they heard about him. I hope he reverted back to the way he was. I can only say my work situation improved greatly not too long after he left. I only had one for a very short time. I was young, early 20s and eager. I was working for a guy as an administrator when they decided to put all the admins in one group under a cranky old (really old) woman. She didn’t like me because I was fairly popular in the office. One of the co-workers was out on vacation for 2 weeks and 2 of us were to cover the work. I preferred to be busy so when I saw work, I did it. The other person preferred to let me do it. I was called into the office and lectured for doing too much work. I got out of there fast! Best opening line in a post that I’ve read in ages! My first boss was a New York Jewish man from the garment district, Sidney Kraft, who opened a clothing store in the little town I lived in during high school. All of the midwest evidently blurred together for him; he couldn’t understand that I was from Minnesota. He would beller over the store’s loudspeaker, “WISCONSIN!” to get me to come up and man the registers. LOVED the videos, Judy. Thanks, Barbara. I confess. That line takes me back to a particular place in time that I’m unlikely to forget. Fortunately, I forged many friendships and built many wonderful memories at the same workplace. “WISCONSIN” does have a nice ring to it. 😉 My daughters and I still chuckle over this movie. I just rewatched “Wise Guys” on Friday (Jan. 2nd) and it still makes me laugh. I love the movie trailer, too. sadly, they can be found everywhere. one of mine, when i was a waitress, made the staff work on easter, without one customer and without him being there. I’d have kept an eye on your boss, too. No way, he’d beat me to that shrimp platter. Ewww! It is sad that some bosses (not leaders) go out of their way to make their reports’ lives miserable and gain satisfaction from that. I wonder how they feel when nobody turns up to their retirement party as mentioned above. You have to wonder what those bosses are thinking, Zambian Lady. My husband, Dave, who was an editor/department head in a newspaper, let his staff know how much he appreciated them. When Dave was laid off, one of his staff went to a restaurant that he knew we ate at. He wanted to tell Dave how awful he felt about what happened. I’ll never forget that and the many others who spoke highly of Dave and were happy for him when he was rehired eight months later. I never know what to expect from your blog posts, Judy, but I know they will always be evocative and educational / inspirational. We had a horrible (read that, Dumb as toast) college president in my last years of teaching but a great one to start with. As long as my colleagues were pleasant and no one interfered with my classroom, teaching, I was happy though. You certainly speak for many! Thanks, Marian. I’ve been wanting to post a story about the movie, “Wise Guys,” for a long time. 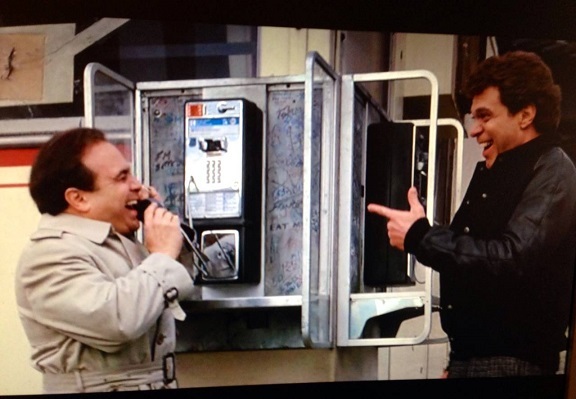 When I started thinking about Danny DeVito’s (Harry Valentini’s) boss … Bingo! 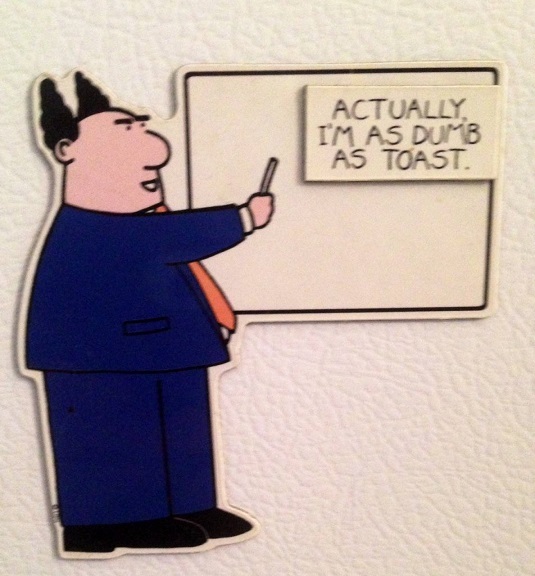 Dan Hedaya (Anthony Castela) and his goons really are as dumb as toast. It was fun to write. But, you are right, there are too many folks who suffer under such awful dunderheads. I’m glad you were able to avoid most of that foolishness. It can really be draining. A dysfunctional work place is demoralizing. It results in higher absenteeism. It’s a shame that some bosses don’t realize that it causes a drop in productivity, reduced employee morale and a high turnover – which means higher costs to train new employees. I have been fortunate to have been self employed Judy for many years . Probably the result of having bad bosses in the past . I had a sneaky boss that smiled false smiles while getting me to do all the work . Now I can thank her because I learnt a lot, in fact, I would never of had the business I had for many years without her . Not working at mo because I have moved to a different area . Did try a job for couple of days but it didn’t work out…I didn’t like the boss …no just joking she was lovely the job just wasn’t for me . Interesting post. You were smart to take advantage of learning opportunities at that job. It did pay off for you. Cherry, Not for your former boss, however, as she lost a valuable employee and then had to retrain someone else to do the work. I’m hoping that you’ll soon land a job that you find more challenging and is more suited for you. Those are the types of jobs that we all look forward to going to. ;-). School principals gotta top the list. I had one who felt she was not doing her job unless everyone feared her and staff was miserable each day. She thought that such elicited 200% effort at perfection from staff. Teaching became just getting through the week to get that paycheck draining any possible joy from the vocation.